Traditional Furniture lasts really long as compared to the simpler different material product. The wooden products is famous worldwide for their designs and durability. Also, the texture and feel seems to refine over the years if usage and that also adds to its beauty. Aarsun Woods brings you a whole range of traditionally handcrafted wardrobes that are highly customizable and can be delivered in India as well as abroad. This particular design is a lot minimalist yet elegant than the most of the designs presented. The Wardrobe consists of traditional 2 Panel Style Doors in Front with designs carved-out in front middle and a frame with similar floral pattern. The unique and spectacular arch shaped top sets this wardrobe apart from the rest of the units. The unit has a small flat area just below the top and above the doors with finely round shaped vase and leaflets and flowers blooming out of it. Even the door Panels has leaf pattern at the top with braided pattern carved at the frame. In total, the unit looks appealing and desirable. 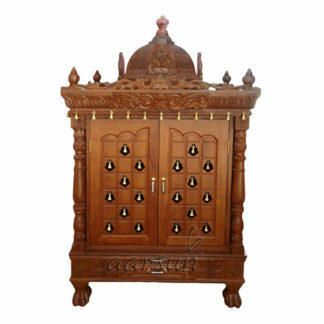 The wardrobe is polished in natural wood finish and is made from premium quality Teak Wood also referred to as Sevan, Sagwan or Sagaun in some parts of India. The Wooden Wardrobe offered by Aarsun Woods is a made to order unit and can be customized as per your requirement. Chat with now or call us at +91-8192999135 / +91-8266888634 for details regarding home delivery and for placing your customization requirements.